Matt Damon and Ed Norton got lessons from Phil Hellmuth and Huck Seed before they played in the 1998 WSOP Main Event to help create publicity for Rounders, but both actors were knocked out on coolers. Norton’s full house fell to quads, while Damon’s pocket Kings couldn’t catch up to Doyle Brunson pocket Aces. 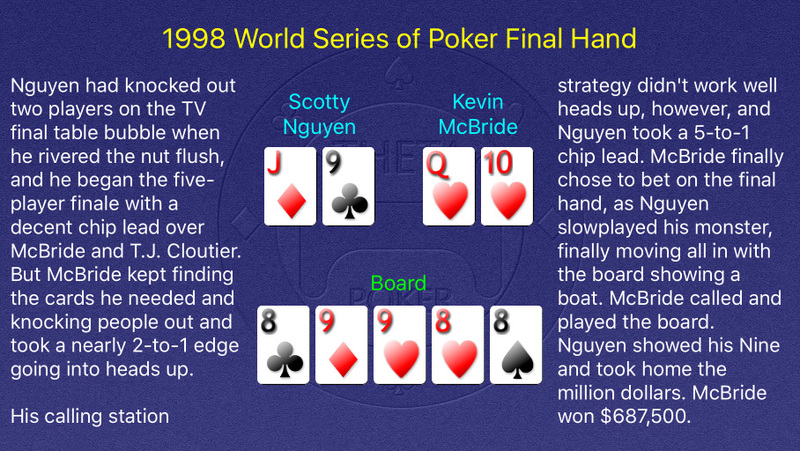 After Nguyen had shoved all in on the river of the final hand, he famously declared, “You call and it’s over baby!” McBride later admitted that this was what goaded him into calling, as he felt Nguyen was lying. Nguyen won almost twice as much for taking down the 2008 WSOP $50,000 H.O.R.S.E. World Championship for his fifth bracelet. McBride’s runner-up finish was the only six-figure cash of his career. He had reached his only other WSOP final table in the $5,000 Limit Hold ‘Em event just before the Main Event.